Swans hold a special place in human culture. References to swans can be found in Greek mythology, Roman and Egyptian history, and the writings of Christian prophets in Europe and Asia. Swans were used on coins in Germany and the badge of Henry IV in England, where records of laws relating to the ownership of swans date back to the 12th century A.D. (Banko 1960). 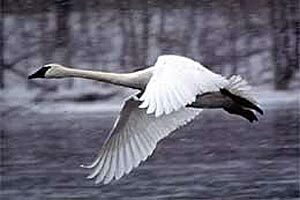 Swans belong to the family Anatidae and the subfamily Anserinae (Bellrose 1976). They have heavy bodies and short, strong legs. Their large webbed feet and long neck make them well adapted for feeding on aquatic vegetation in shallow marshes and lakes. Adult swans will consume about twenty pounds of leafy aquatic vegetation in one day. Trumpeter swans (Cygnus buccinator) may live up to twenty-five years. The plumage of adult trumpeter swans is pure white and they have black bills and feet. Swans are very large, weighing 20 to 30 pounds and measuring 4 to 5 feet long. They have graceful necks that are as long as their bodies and a wingspan up to 8 feet across. Adult males are called cobs, and adult females are called pens. They usually mate for life and normally begin nesting when they are 3 or 4 years old. 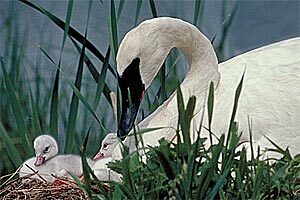 A pair of swans may build their nest on a muskrat house or construct it entirely from marsh vegetation. Nest mounds are approximately six to twelve feet across and eighteen inches high. They will defend aggressively up to 100 acres of wetland territory against other swans or predators. In late April, pens will lay a clutch of 5 to 7 eggs. The young swans, called cygnets, will hatch after 33 to 37 days of incubation. Cygnets have a light gray plumage with pinkish bills and feed mostly on aquatic insects and crustaceans during their first weeks of life. In July, while the cygnets are flightless, the adult swans lose their primary wing feathers-the ones they need for flying. During this flightless period, adults often stay hidden in the marsh with their young while new feathers are growing. In August, adult swans grow new primary wing feathers and start to fly again. The cygnets first fly in September when they are 14 to 17 weeks old. The swans migrate south in small family groups to wintering grounds in the central United States, including open water sites along the Mississippi River in Arkansas and Missouri and west to Oklahoma. In late March and early April, the swans return north to their nesting marshes. There the one-year-old cygnets leave their parents to live on their own. Adult swans begin their annual cycle of building nests, mating and raising their new cygnets. Banko, W. E. 1960. The Trumpeter Swan. U.S. Dept. of Interior, North American Fuana 63, 214 pp. Bellrose, F. C. 1976. Ducks, geese and swans of North America. Stackpole Books, Harrisburg, PA. 544 pp.